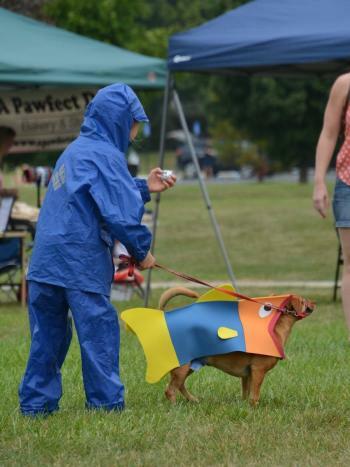 The Bow Wow Bash has become one of the best events in Hendricks County, Indiana, for dogs and their owners. Here are five reasons why you should check out this year&apos;s event on Aug. 26 in Brownsburg. This year&apos;s Bow Wow Bash includes entertainment for the whole family, such as dog contests (including the popular dog/person costume contest), a pet blessing ceremony, a silent auction and a ball drop. New this year is a lure course and a "woof walk" through the woods at Williams Park. Winners of this year&apos;s contests will receive fantastic prizes provided by PetValu. Several food and other vendors will be on hand making it easy to spend the whole day at the bash. Organizers said this year there will be more vendors than ever before. Fifteen rescue groups will have more than 100 dogs and cats up for adoption. What a great opportunity to add a new member to your family while finding a loving pet a forever home. Proceeds from the Bow Wow Bash will benefit the Misty Eyes Adoption Center. Previous bashes have helped fund the administration building that is on South County Road 800 East in Avon. Proceeds from this year&apos;s bash will help fund a kitty village and dog facility. When: 1-5 p.m., Aug. 26. Cost: $5 suggested donation per person; Kids and pets free.$20 VIP tickets are available and include a free shirt, hot dog, drink, and chips.